Those fortunate enough to own waterfront real estate in South Florida are treated to a sensational sunrise each morning and a therapeutic salt breeze each night. The crystal blue waters of the Atlantic Ocean and the soft, sparkling waves of the Intracoastal Waterway yield endless summer fun for homeowners, boaters, and beachgoers. From basking in the sun on the white sand beaches to fishing for tarpon from a personal dock, waterfront properties embody the best of Florida’s timeless lifestyle. Perhaps no other city describes the waterfront lifestyle better than Palm Beach itself. A historic landmark, the island is lined with custom oceanfront estates, which are not visible from the road because of privacy hedges and gated drives. Many of these estates, which range in price from $5 million to more than $74 million, feature private swimming pools, cabanas, separate guest houses and workers’ quarters, exquisite exterior grounds, and illustrious interior detail. Oceanfront condos such as 400 South Ocean and Palm Beach Hampton afford residents the opportunity to enjoy the Palm Beach lifestyle, without the hassle of maintaining a large estate. A seasonal town, Palm Beach is most active from October to May, with most residents returning to the northeast during Florida’s steamy summer months. Showcasing breath-taking views of the Atlantic Ocean, oceanfront estates in North Palm Beach are found within the gated communities of Lost Tree Village and Seminole Landing. At Seminole Landing, oceanfront homes feature private access to the white sand beaches. 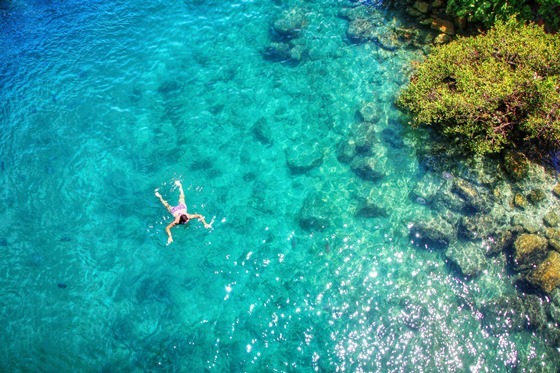 At Lost Tree Village, home buyers have the option of an oceanfront estate, golfview home, villa on Little Lake Worth, or home on the Intracoastal Waterway. In this community, homes for sale on the Intracoastal Waterway often boast their own private docks and boat lifts. Waterfront condos in North Palm Beach such as Gemini, Old Port Cove, and Water Club attract retirees, snowbirds, and year-round residents who appreciate the breath-taking views of the Atlantic Ocean, the abundance of amenities, and the low-maintenance of condo living. Jupiter’s waterfront real estate includes oceanfront estates, Intracoastal Waterway homes, as well as homes along the Loxahatchee River and navigable canals. Yachtsmen appreciate stowing their personal vessels at Admirals Cove Yacht Club, a private marina that accommodates yachts up to 130-feet. 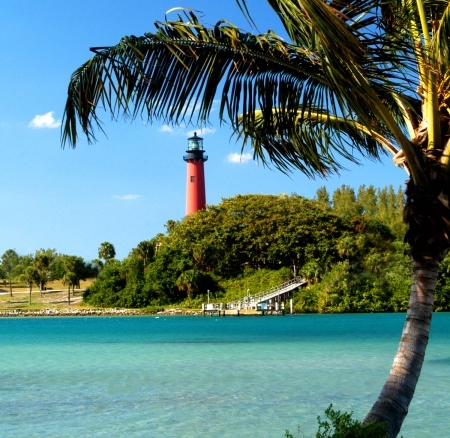 Jupiter Inlet Colony, located at the mouth of the Jupiter Inlet, is comprised of homes overlooking the Intracoastal Waterway, the Jupiter Inlet, and the Atlantic Ocean. Loxahatchee Pointe, Jupiter River Estates, Tequesta Country Club, River Ridge, Heritage Oaks, and Pennock Point are all situated along the banks of the Loxahatchee River, a federally designated scenic river that is ideal for fishing boats, jet skis, paddle boards, and recreational water sports. Located between Jupiter and North Palm Beach, the two-mile stretch of land known as Juno Beach is home to numerous oceanfront condos, townhomes, and estates. 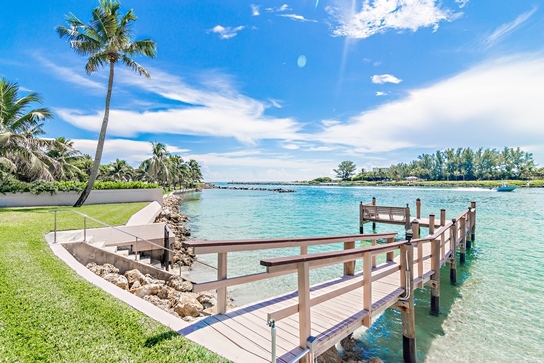 Though no oceanfront homes, Palm Beach Gardens neighborhoods such as Maheu Estates and Cypress Island are perfectly placed alongside the Intracoastal Waterway. Many of the homes in these communities feature in-ground swimming pools and private docks. Farther south, Delray Beach, a swanky seaside town with an artistic bent, offers oceanfront homes and condos as well as townhomes and villas along the Intracoastal Waterway or beside a deep water canal. Given Florida’s warm, tropical climate, those purchasing waterfront real estate in the Palm Beach region are pleased to enjoy their outdoor amenities year round.